a small collar and lead. Before you collect your pet, make sure you have it’s accommodation organised. Initially you will need a small bottle and a lamb’s teat. Most farming outlets will stock these, along with bags of lamb powdered milk. Follow the directions on the bag carefully when mixing the milk. With these pets, the feeding rules are "a little, often”. 8 am, 12 noon, 4 pm, 8 pm. For very young lambs 4 hourly is best. See feeding schedule overleaf. Initially they will only drink about 1/2 of a small soft drink bottle. Increase this amount gradually. Once the pet starts nibbling grass, decrease the number of feeds to 3 a day, and then to 2 a day. Lambs can be real little "guzzlers” - they often don’t know when they’ve had enough. Never give them more because they’re pestering after the bottle. After feeding, their tummies should be nicely rounded, NOT bulging! Like calves, you can over-feed these pets. Healthy pet lambs often die for no apparent reason - it is wise to inject them for Pulpy Kidney, as this is a major killer of young lambs. Good housing is essential. Young animals tend to chew plants indiscriminately and as a result there’s many a Daphne bush and Rhododendron that’s met an untimely end, as has the lamb that ate it! Both these common shrubs are deadly poisonous to your lambs. Feeding Schedule - use a baby’s bottle or small coke bottle for small lambs for the first 2 weeks or so. Newborn animals should be fed on colostrum for at least 3/4 days. 6 wks to weaning 1L or follow what is on the bag of milk powder. Feed small or weak lambs little and often. Contact your vet for advice and for treatments such as electrolytes or scourban. As the lambs get older, keep an eye out for worms. Signs are runny motions, scouring or worms in droppings. If your lamb shows any of these symptoms – treat immediately with wormer. All lambs need to be drenched for worms at approx 6 – 8 weeks. Check with your local vet or farm supplier. Should be done mainly because as the lamb gets older it helps with fly control etc. Docking should be combined with the lamb vaccination. Your child must train and feed the lamb if they want to be successful at Agriculture Day. It is also good training for your child to accept responsibility for the walking of their pet. Lambs train best when hungry - 10 minutes before feeding is ideal. Start training at about 1 week old, at least once a day - preferably twice. Tie lamb up daily for a short time to get used to being on a lead. Lamb walks on the child’s right, with its shoulder beside the child’s leg. Lambs like to have their head in front, once the child gets in front of the lamb, it gets stubborn and pulls back. If lamb stops, the child should stop and encourage the lamb to move by talking to it or clicking their tongue. The lead is held in the child’s right hand firmly, but not so tightly that it pulls on the collar. The lead passes across the front of the body and the excess is coiled in the left hand. Please see the attached sheet on leading course and follow instructions. Encourage your child to talk to lamb while leading, and in training give the stakes a wide berth, so the pet won’t stop and sniff at the stakes. As "calling” is an important part of the judging, preparation for this can start as soon as you get your pet. Lambs learn quickly and they respond well to a "reward” system. At feed time, whenever possible, hold the lamb some distance from your child, who holds the bottle. On releasing the lamb the child should call the lamb by name, and "reward” it with its drink, repeat the process two or three times during the early feedings, and soon your lamb will learn to associate the child’s voice with feeding, and will dash to them whenever they call. If you don’t teach your pet to come to you, you can’t expect it to magically co-operate with you on Ag Day. Sometimes, lambs that have been taught don’t co-operate either on Ag Day, causing frustration to their owners! Wait until the lamb is at least a few weeks old before you start to train. Some lambs never adjust to being led, and will vigorously object to this process. Have patience and take it gently - it is easy to damage their fragile little necks by dragging it along! If the lamb has been confined to a small pen during the day they will often enjoy a walk outside before afternoon feed time. Start them off by getting them used to wearing their collar, then introduce the lead. Learn to walk on a pathway or driveway (with sides to the path) , not across an open space. Teach the pet to walk with you at your pace - a trick with this can be to feed them a favourite treat as you walk. Some lambs are particularly partial to raisins, bread or sliced apple, or Dairy ration or similar. It is important when teaching a lamb to lead, to be consistent and regular in your practice. 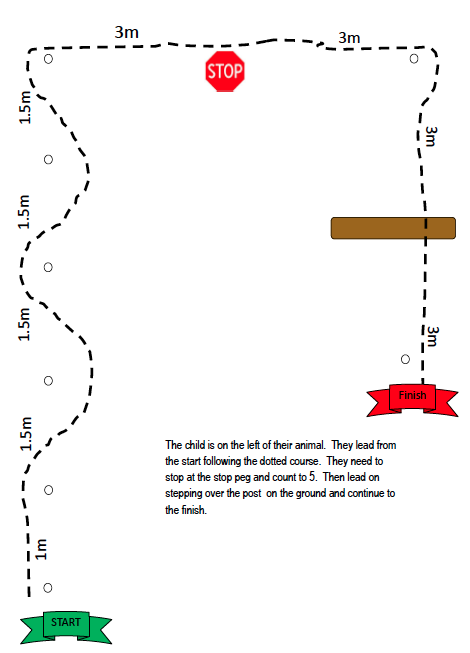 Most Ag Days require the lamb to walk around a set course ( a copy is attached). You are judged on how you perform as a team. Your pet should walk freely alongside you, not in front or behind you. The child is placed at one end of an enclosure - a Judge’s steward will take the lamb to the other end; when the child calls, the pet is released. The winning pet will dash straight to its owner. The children should use a loud calling voice. It will be penalised if it dashes past the owner, or into the crowd to find "MUM”, who wasn’t supposed to feed it at all, or if it saunters off in another direction. A well trained lamb will recognise a familiar voice and in most circumstances will respond - especially if they’re hungry - so don’t overfeed it before "calling”. Give it a drink after Judging is over. Know what breed your pet is so the Judge can make a qualitative assessment of your pet’s development. NEVER shampoo or brush your lamb. Apart from being contrary to the rules of Agricultural Day, it destroys the lanolin in the wool and leaves the animal susceptible to chills that are fatal. Lambs will need to be drenched for worms. Your vet or farmer will advise you on this. Any changes should always be checked out. Lambs should be docked (tails removed) and injected against "pulpy kidney”. Most farmers will accept the return of your pet after Ag Day and Group Day and to be fair to both animal and farmer please ensure the animal is old enough to be weaned. It is wise to make these arrangements with the farmer beforehand. vaccinated with Lamb Vaccine or Pk/Antitet at docking. If the lambs are born to fully vaccinated ewes and have received adequate amounts of colostrum in the first day of life they will have protection for about three months. All lambs should be vaccinated with a 5 in 1 vaccine at weaning at around three months of age. A sensitising dose and a booster dose one month later is required.